My Dad Purchased This Subaru Wagon New from a Dealer in Hollywood, CA (USA) in 1985 and the Subie Came Runnin’ new, from there to my Country, Honduras, at the caribbean central america… I Can’t imagine any Better Way to Break New an Engine! 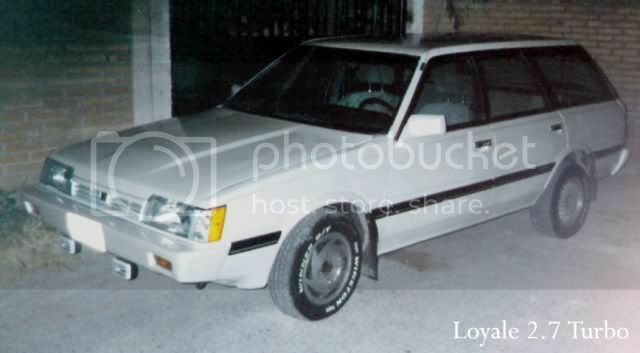 This Subaru wagon is a GL and came with white paint, EA82 carburated engine and 5 speed manual transmission. After hurricane mitch hitted and devastated our country in 1998 (as you might want to read statistics and see photos, here: ~►http://en.wikipedia.org/wiki/Effects_of_Hurricane_Mitch_in_Honduras) a friend of my dad that owned a similar Wagon that had a blown engine, sold it to my Dad as parts car; eventually we obtained the engine off from a wrecked Subaru AlcyoneXT6 (ER27) and we managed to fit it on the former parts car, painted it on yellow and that was how we started the Project “Loyale 2.7 Turbo” and thus explains my Screen Name. Despite that there were no place on engine’s bay to put a normal Radiator on the 2.7 and it was running hot with a tiny pair of lateral radiators and electric fans, (You can read the complete details of such engine swap, Here: ~►http://www.ultimatesubaru.org/forum/topic/122165-ea82-to-er27-swap/) the car worked, until it was wrecked in a huge frontal car crash, as you can read the details, Here: ~► http://www.ultimatesubaru.org/forum/topic/113641-could-this-be-the-end-of-my-27-project/. Since I Lost my Dark yellow 2.7 wagon, I took some parts from it to Transform my Good Ol’ White Weberized EA82 Subie onto a Much Better Machine, with the Best parts from the Two, and made many, many modifications to it. 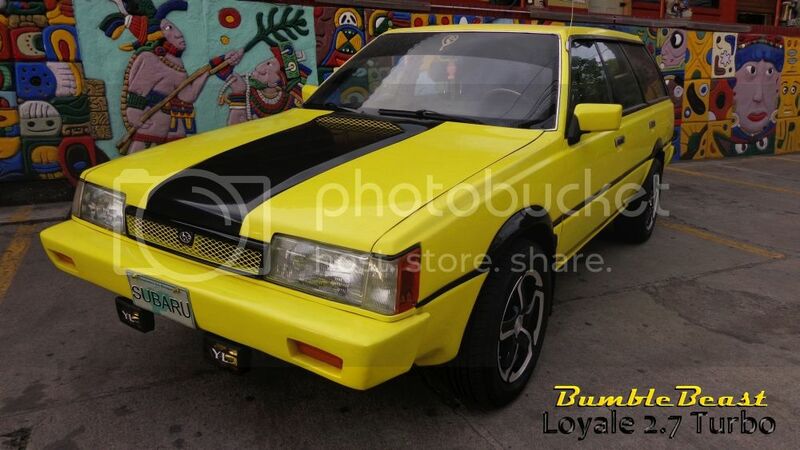 ► I Used Brighter Yellow Paint for the Body and Deep Black Paint for Stripes! ► I “Shaved” the Subie’s Body. ► Lifted it for medium duty offroading! ► and I made many, Modifications, Retrofittings & Swaps. Here in my Country, ALL the Taxis are White, and 85% are Wagons! … … So, My white wagon was Looking like a Taxi … … also I Really Love How those wagons Looks in Yellow; That was my Motivation to Change its Colour. Part of the Minor body Design Changes are, a sheetmetal Hood Scoop, which I name: the “InterFooler” … … the Original Idea was to Let the engine to Scream out Loudly thru the Weber Carb’s throat during deep acceleration! … … Also I changed the Lug pattern redrilling the hubs to use Different Rims, and many, many more Modifications, which will be explained in this thread. I payed my university studies by repairing cars and other things such like Computers, household appliances, etc; and Still I do all that everyday. I learned english by myself, so I hope I could write clearly. 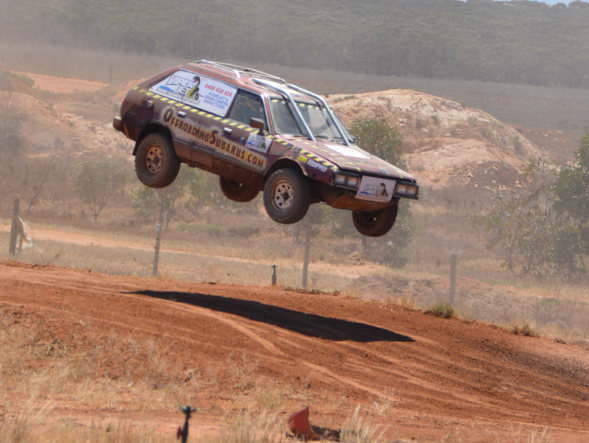 Loyale 2.7 Turbo – who has written 1 posts on Offroading Subarus.